Fossils preserved in amber provide us with a unique insight into the biodiversity and ecology of long extinct tropical forests. Today, similar habitats contain a major proportion of the planet’s biodiversity, although they are disappearing at an alarmingly rapid rate, primarily as a result of human activities such as deforestation. The hot, humid environments of these habitats in conjunction with the vast armies of decomposers and other recyclers limit the potential for fossilization in the traditional sense. Hence, fossils in amber represent an invaluable resource for reconstructing tropical forest palaeoecosystems and for understanding global change over extended time periods. The degree of amber preservation is so exquisite that even minute structural details of fragile insects and other arthropods that are millions of years old are clearly visible. Indeed, some are preserved with such life-like fidelity that their immediate demise following encapsulation in the sticky resin provides us with snapshots of fossilized behaviours. These include mating, egg laying, parasitism, feeding and predation to name but a few. Technological developments and the application of advanced imaging methodologies to these fossils means that we can now extract more information than ever before. Not only is this useful from a scientific perspective, but it also means that the true magnificence and beauty of the inclusions can be reproduced and appreciated by all, rather than just a scientist looking down a microscope. In this book the authors combine their individual skills to bring some of the world’s best preserved and unusual specimens into the public domain. Dr David Penney of the Faculty of Life Sciences, University of Manchester is a renowned amber palaeobiologist, Dr David Green is an honorary researcher at the University of Manchester and the National Museum Wales and an expert in photomicroscopy. 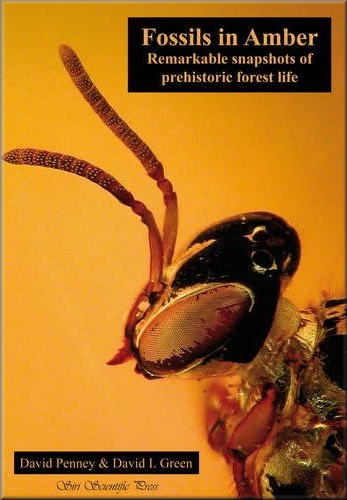 The result is a spectacular collection of photographs combined with authoritative text, covering all the arthropod orders likely to be encountered as fossils in amber. 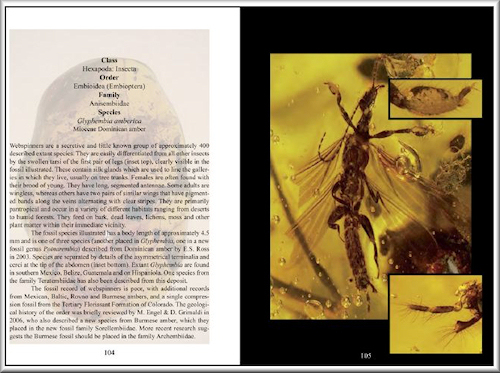 In addition to explaining how best to photograph amber inclusions, the accompanying text provides interesting background information regarding identification, biology and palaeontology of the figured specimens. This is a full color, softback book, 226 pages and about 8.6 x 6 inches in size. The publication date is April, 2011.